The time has come again already to leave for our summer adventures. Summer is a bit of an overstatement at present, with frosts and night time temperatures of -3 ° C, but we are on our way and we know sunny days and warm balmy evenings are not far away.As usual it was a 6am start, getting the engine going and warmed up, then leaving the mooring at 7.30am. Well it has happened at last. Not unexpected but John Taylor, our smashing vet, called to the boat on the morning of the 26 Feb and gave Roly the kind injection. Poor old Roles had been sick, and couldn’t seem to get his breath. He was so weak that John said there was nothing more we could do for the old boy and so at 11.30 Paul took Pip off for a little walk and Roles fell into his final sleep. After watching him struggle to breath, it was a blessing to see him so peaceful. And how was Pip with all this? You’ll be relieved to hear she is fine, even better than fine! There’s no sentimentality in the dog world. Paul brought her back on the boat to see Roles, and to understand he was dead. She didn’t even go over to sniff him, she just barked for her biscuit – and then for his as well. John explained that they seem to know straight away. Our old friend was 17 years old and here are a few pictures of him. When I get the chance, and when I stop crying when I think about him, I plan to add a few more pictures, taken when he was younger. Bye old friend. Nothing up on the blog for a while ’cause we have been busy with work and stuff. 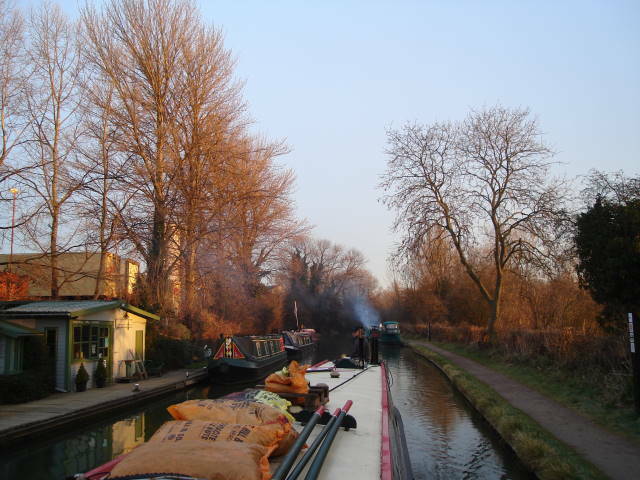 Latest plans are that we will go and work for Barry and Julie who are managing a boatyard at Eynsham on the Thames, from March until end Sept.
We will leave Banbury at the end of Feb and go down to Oxford for a week. The we will move an Anglo boat from Bradford upon Avon back up to Eynsham. We will be joined by Gemma and Nik, and their dog Tye, who will be moving another boat at the same time. Hope we can keep up with these young people and their wild ways! Start work at Eynsham on the Wed before Easter, then every Friday, Saturday and Monday through the summer. I have asked for a week off starting end May. I plan to leave Paul and go with my sister Julie back up to Yorkshire to see family then onto Appleby Horse Fair. You are currently browsing the Daniel Oakley blog archives for February, 2008.